There are many diets right now that focus on eating a low-carb, moderate-to-high fat and protein diet. Diets like Paleo, Keto, or Atkins aim to control carbohydrate consumption to help with weight loss, blood sugar management, muscle-building, and control of chronic diseases. If you’re following one of these diets, you know how important it is to keep your carb levels down. Just a few too many carbs can knock your body out of ketosis, slowing weight loss and minimizing the health benefits of the diet. In fact, if you’re experiencing a slow-down of weight loss or you’re not feeling well on your diet, the problem may be hidden high carb vegetables. Not all vegetables are created equal, so if you’re watching carbs, you need to pay attention to the vegetables you eat. There are five categories of vegetables, each with their own general carbohydrate count. These are your lowest carb vegetables, and you can pretty much eat as much of these as you like, as they generally have less than one gram of carbs per serving. They’re also rich in vitamin K, full of antioxidants and nutrients, and rich in minerals and micronutrients. These have a few more carbs per serving (roughly one to five, depending on the vegetable) but they’ve still got the green light for a low-carb diet. These are more flavorful than some of their leafy green cousins and adding them to your soup or salad is a great way to increase the tastiness of your meal. Yes, vegetables with seeds are really fruits. And that helps to explain why they’re higher in carbs than leafy or stemmed greens. As fruits, they come with a bit more natural sugar. While most of them keep below a moderate six carbs per serving, some can get a bit carb-y. All of these are under the six-gram carb level, and some, like avocado, have very few carbs. We’re edging into higher carb territory now, but only two of these, beets and peas, go above five carbs per serving. While onions and carrots have four and five grams of carbs per serving, it’s tempting to overeat them. They both cook down, so a half-cup serving doesn’t look like much. Here they are – the highest carb vegetables and the ones you’ll want to watch for on a low-carb diet. Carbs are listed for each serving (1/2 cup) of these, so you can see how very high they are. Just a small amount of these can take your low-carb diet off the rails. These should be avoided, and the root vegetables, above, minimized. So, where’s the hidden source of vegetable carbs in your diet? Many times, soups and sauces are the culprits. They seem light and refreshing, but they could be loaded with carbs. One cup of tomato-based soup, even made with fresh tomatoes, can have over eight grams of carbs in a one-cup serving. And that’s not counting anything else you put in the soup! The carbs in a vegetable soup filled with onions, carrot slices, and potato cubes can add up quickly, even though it seems like a simple, healthful choice. And any dressings or sauces that are made from pureed root or starchy vegetables increase carbs in your menu. Onions are often added to sauces, soups, and stews for increased flavor. But with five grams of carbs in a half-cup, they can quickly exceed your limit. To keep carbs low, choose mostly vegetables from the first three categories. 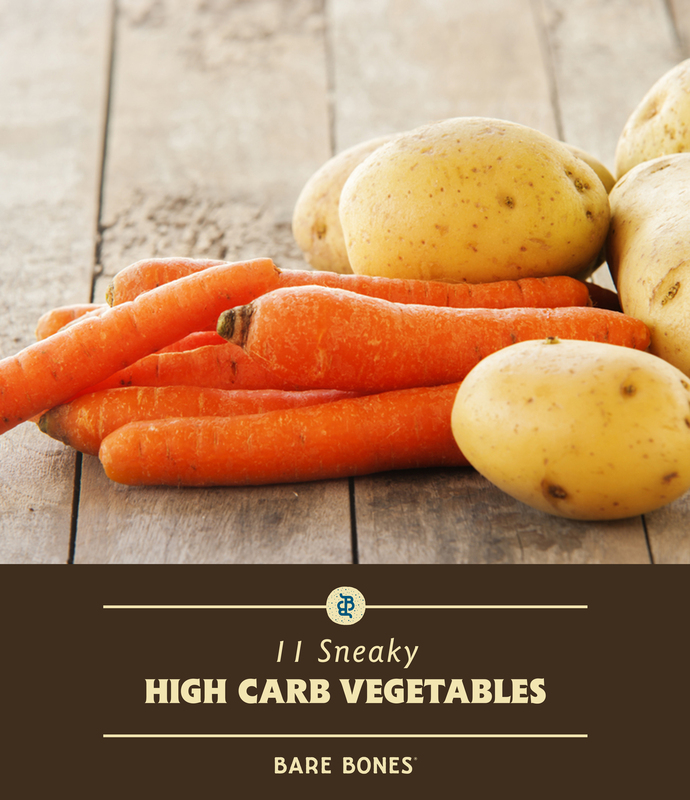 Minimize root vegetables and avoid starchy ones altogether. Pay close attention to soup bases, sauces, and dressings and carefully measure servings of vegetables that cook down, like onions, carrots, tomatoes, and beets. Keep track of “sprinklings” of corn, carrots, peas, and potatoes in casseroles, stews, and wraps. If you pay close attention to the details of your menu, you’ll discover where your high-carb vegetables are hiding. Once you find them, you can cut them out of your low-carb diet and return to ketosis – and good health. Really good information, thank you~! I enjoyed that it is explained quickly, clearly, very easy clean format…. Thanks Vicky, glad you enjoyed it! Let us know if theres anything specifically you’d like us to write about! Cheers!